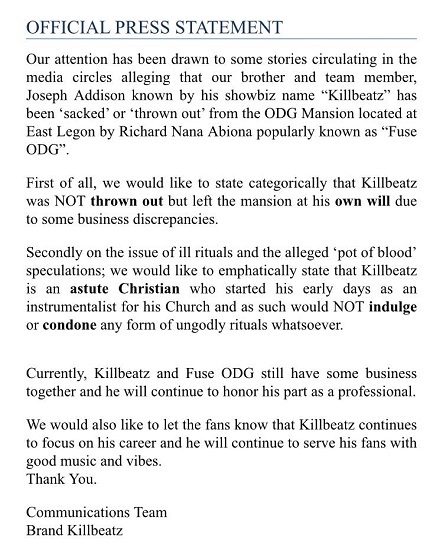 Award-winning producer and sound engineer Joseph Addison (known in showbiz circles as Killbeatz) has finally spoken on the news circulating in the media that he has been sacked from Fuse ODG’s East Legon mansion for flouting certain rules of the house. A presser released by Killbeatz’s team on Wednesday December 6, confirmed that the producer has left the mansion, but did so at his own will. The statement also debunks rumours of his alleged involvement in occultic practices in the house owned by the Azonto singer. The statement further assures fans of Killbeatz that he will continue to produce quality music and honour his part of his professional contract with Fuse ODG. Killbeatz in most recent months has produced top charting songs, notably among them is Kuami Eugene’s “Angela”, King Promise’s “Oh Yeah” and “Selfish”, Fancy Gadam’s ” Total Cheat”, B4Bonah’s “My Girl”, as well as Fuse ODG and Ed Shareen’s Boa Me. He has produced beats for both local and international acts like R2bees, Samini, Wizkid, Davido, Sean Paul, Wyclef, Efya.